Main purpose of this assignment is to analysis and discuss on Modern Farming Equipment for Sale That Every Farm Must Have. Here focus on Modern Farming Equipment for agriculture benefits. 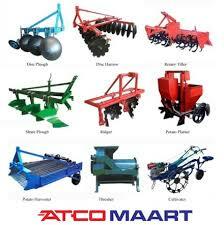 These are equipment that help set up the soil for planting such as ploughs and hoes, aerators and cultivators. Ploughs slacken off the soil and turn it to prepare the land for planting. Cultivators cut in to the soil lines or grooves where seeds are planted. Equipment such as row planters and seed drills are also classify under this.